It is not a secret any more that people need to be connected to internet even when they are asleep. We all need to update Facebook ,twitter or even Instagram. From student to professional. Internet is a must no matter where we go. Its like you are not wearing a trouser if you go out and left your smart phone at home. So no wonder Maxis and Celcom are trying their best to capture more market share with their Broadband Plan. As you can see form above table, comparison between Celcom and Maxis Broadband plans. Celcom comes up with just three simple plan as low as RM68/month to RM 138/month. While Maxis Broadband offers flexibility with plan ranging from RM48/month to RM158/month. You have 5 choices, Light, Casual, Heavy and Power. Maybe student can pick Light or Casual plan to save their budget. With Celcom, you can only get either 4 GB for RM 68, 6 GB for RM 98 and 10 GB for RM 138. With Maxis, you can get more. As you can see for RM 68 you can get 8 GB compare to Celcom 4 GB only. Plus with RM 128 per month you can get 7 GB from 8 AM to 2 AM, plus 21 GB from 2 AM to 8 AM so total of 28 GB. So, Maxis is a clear winner here for Data Volume. Celcom provide PortaWifi 4G LTE USB modem with 3 pin plug to use at home and a car charger/adapter to use on the road. Maxis offers three different kind of modem. 7.2 Mbps USB modem, 21 Mbps Portafi or 21 Mbps Mifi. 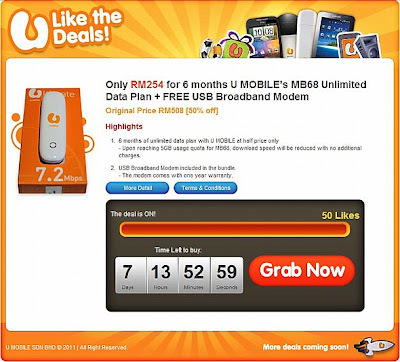 Plus you can get 75 Mbps Mifi 4G LTE with additional RM 240. Also come with car adapter/charger and 3 pin to use at home. With all Maxis Broadband plan, you can get free 5 GB Loker Cloud Storage. Here you can store document and music and picture. Also FREE 2 GB Maxis Hotspots but not for 3 GB plan. You can also get unlimited access to Facebook if you subscribe to Power plan. (48 GB). You can also get one month free of charge with Maxis if you order online. Bare in minds that all this plan is 12 months contract, so choose your plan wisely. Plan your data usage. If you exceeds your maximum quota, your internet speed will be throttled. I hope Celcom can come up with better Broadband plan. Celcom is proud of their 4G LTE speed, have you tried it?. But still depends on your location wise to get maximum speed. Hopefu;;y this comparison can help you choose the best wireless broadband. The iPhone 6 and 6 Plus will only be available in stores on 6 November this Thursday. However, Celcom, Maxis and Digi are offering pre-order online. You can register your interest by providing personal details on their website. However, Digi and Maxis are not prepared to handle huge traffic to their website. Their pre order site facing a disaster, when both server Digi and Maxis were down due to huge interest from Malaysian by midnight except for Celcom. I think Celcom is well prepared for this big occasion. Both sites down for several hours and came back online around 230 am. Maybe they were not expected this kind of traffic, well Apple fan will always be an Apple fan. You can click to Digi Online store and Maxis Online store back to see their plans for iPhone 6. Last but not least Celcom Online Store. Different telco unveiled three different plans to attract new customers. The picture above from Amanz.my showed different specification between 3 major model, Samsung Note 4, Nexus 6 and iPhone 6 Plus. You can clearly see how Note 4 and Nexus 6 outclassed iPhone 6 Plus. While you can get Note 4 just only RM 2,500 with 32 GB storage. Well, what can I say, its your money. Think twice before spend it. As we all know, more and more Android application requires a lot of mobile data network, and more data means more money. Mobile data is either charged per MB use, or added in as part of your monthly payment. There will be a certain limit cap included in your plan. There are however, a few tips that you can save your mobile data network. There is an argument for emptying the browser cache (and the cache of other apps) to help keep your Android smart phone running smoothly. The cache is a component that stores data ready for use. When that data is requested again, by the browser for example, having it in the cache means than it can be provided faster and without requiring it to be fetched from the web server where it was originally held. Emptying the cache will free up internal memory space on the device and help the whole system to run slightly better. However, if you are trying to reduce data usage, leaving the browser cache intact has obvious benefits. If he browser doest not have to fetch images and other components of regularly used websites, it does not have to use so much of your bandwidth quota. Task managers and cleaning utilities often clean the cache, so if you have one installed, add your browser to the exclude list. You also can save an area in Google Maps for offline use? Open up your the Google Maps app when connected to Wireless Network and select the area you want to save. Then select Menu > Make available offline or go to Maps > My Places > Offline and click New offline map before selecting the area you want. You can also review your offline maps via Maps > My Places > Offline. Increasingly, website have both full and mobile versions available. This is particularly true for large, popular websites such as Amazon, E bay, Facebook and Youtube. Many website will automatically display the mobile version, but some will will give you the option to choose. The mobile version of a website is designed to be quicker to load and use less data to do so, so it make sense to choose the mobile version if you are trying to conserve data usage. Aside from difference in layout and content, you can normally tell if a website is running he mobile version by the “m” in the url (some website will display mobile or mobile web instead). You can also check by scrolling to the bottom of the page and check to see if there is a link to the Full or Mobile version. Stick to the mobile version whenever possible and your data usage will be reduced. There are several browsers that are designed for use with slower data connections. This means that they are optimised to need less data and therefore will use up less of your quota. Opera mini uses only a tenth of the bandwidth of other browsers, compressing webpages by up to 90%. With Opera Mobile, turning on Opera Turbo compresses data by up to 80%, or leave Opera Turbo off to get full website data, as you would on a PC. Opera’s speed and efficient controls put it ahead of many other comparable browsers. Surf the web on your mobile as easily as on a desktop computer and reduce data costs by up to 90% with the uniques compression technology.